I love the idea of serving soufflés in a plate – l first came across it in France and find its lack of pretension very pleasing. And I never get bored of lemony goat’s cheeses, especially in the summer. Preheat the oven to 200°C/gas 6. Whisk together the goat’s cheese, egg yolks, half the Parmesan, the cream and half the chopped thyme. Season. In a separate, very clean bowl, whisk the egg whites with a small pinch of salt, until stiff peaks have formed. Stir one third of the whites into the cheese mixture, then fold in the rest. Brush the insides of six 175–200ml ovenproof dishes with the butter and sprinkle over the remaining Parmesan. Divide the soufflé mixture between the dishes and scatter the remaining chopped thyme over the top. Arrange the dishes on flat baking trays and bake for 10–12 minutes until the soufflés have puffed up and turned golden brown. Garnish with little sprigs of thyme and serve immediately. 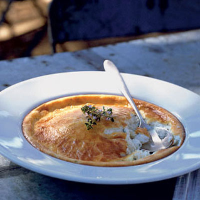 The Corker recommends Try these soufflés with a glass of classic English cider.